After exhausting all means to placate some critical stakeholders in the party who are aggrieved owing to the fall-out of its controversial primaries, the ruling All Progressives Congress (APC) has decided to wield the big stick on party members, especially state governors who are working against the interest of the party to achieve victory in 2019 general elections, Daily Independent has gathered. 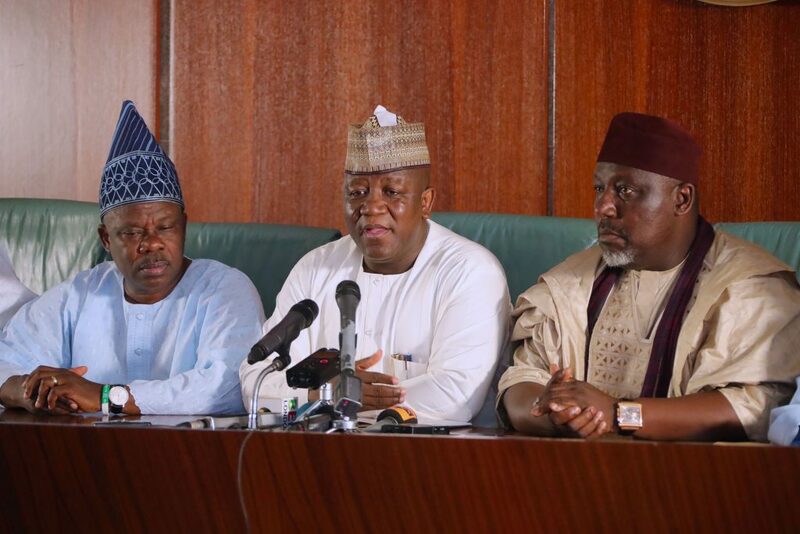 On the cards to be punished, according to a credible source, are Governors Abdulaziz Yari of Zamfara, Ibikunle Amosun of Ogun, Rochas Okorocha of Imo and Rotimi Akeredolu of Ondo, among others. The party leadership last month set up a reconciliation committee but majority of the governors refused to cooperate with members of the committee thereby foreclosing any chances of rapprochement. Speaking with Daily Independent on Thursday, a member of the party’s National Working Committee (NWC) said Comrade Adams Oshiomhole, the national chairman of the party will soon set up a disciplinary committee which will “look into the activities of some of the stakeholders especially some of the governors who are encouraging their supporters to join other parties. “I think the party has had enough of the governors and actions will be taken against them. Through their actions and utterances, they have shown utmost contempt for President Muhammadu Buhari who has done everything humanly possible to resolve the issue. They have also disregarded other national leaders such as Asiwaju Bola Tinubu and others. “The party leadership will in the coming days set up a disciplinary committee which will look into the activities of this men and make recommendations to the party. There is a need to sanitise the party, remove the bad eggs and reposition it ahead of the 2019 general elections”, he said. On what can be done to the dissidents, our source said they may be suspended, expelled or have their tickets withdrawn. In Ogun, loyalists of Ogun State governor, Ibikunle Amosun, have announced their defection from the APC to the Allied People’s Movement (APM). Adekunle Akinlade, Amosun’s preferred candidate, is the governorship candidate of the party. The governor who is at daggers drawn with Oshiomhole over the outcome of the primaries said he will remain in the APC to contest the senatorial election in 2019 while ensuring the re-election of President Muhammadu Buhari. The governor, who said that he would not support the governorship candidate of the APC, Dapo Abiodun, however, said aggrieved party members who defected to the APM have his blessings. The same scenario also played out in Imo State where Uche Nwosu, the son-in-law to Governor Rochas Okorocha, has dumped the APC for the Action Alliance (AA). Nwosu, who lost the APC ticket to Senator Hope Uzodinma blamed the loss on the party’s leadership. Okorocha, who has also given Nwosu his blessings, is working to move his loyalists en masse from the APC to AA, sources in Imo Government House said. Meanwhile, on Thursday 19 out of the 27 lawmakers of the Imo State House of Assembly joined AA, denouncing their memberships of APC and the Peoples Democratic Party (PDP). The speaker of the state House of Assembly, Acho Ihim, who read the notice of defection signed by the lawmakers during plenary, equally announced that he had joined his colleagues in AA. Reading the defection notice, Ihim said that the members elected on the platform of PDP have also joined AA. According to him, the defection notice was dated November 7. The former PDP lawmakers are Ken Agbim, Bruno Ukoha and Mike Iheanatu. Others are Chinedu Offor, Kennedy Ibe, Lawman Duruji, Max Odunze, Henry Ezediaro, and Obinna Egu. In Ondo, loyalists of Governor Akeredolu such as Tunji Abayomi has also dumped the APC for AA. Abayomi, who has the governor’s full backing, claimed to have won the senatorial ticket of the APC to contest the senatorial election to represent Ondo North Senatorial District at the National Assembly. He also alleged that the national leadership of the party gave the ticket to the serving senator, Ajayi Boroffice automatically at his expense. Following these developments, the Buhari Media Organisation (BMO) also advised the national leadership of the APC to withdraw the ticket of any party leader backing candidates in other political parties for the 2019 general elections. BMO, said in a statement signed by its Chairman Niyi Akinsiju and Secretary Cassidy Madueke that such acts amount to anti-party activities that should not be encouraged. Speaking to Daily Independent, Prof. Itse Sagay, Chairman of the Presidential Advisory Committee Against Corruption (PACAC), said having immunity does not stop a governor from being disciplined. “Of course, governors can be disciplined by the party. There is no immunity in party affairs. They can be suspended or expelled as the case may be depending on the level of their offences. Immunity is against the state bringing criminal charges against a sitting governor. The whole idea is to prevent a situation where a governor will be so distracted by civil or criminal charges. That has nothing to do with the party. The party can discipline a governor”, he said.